When you’re choosing the person to capture your wedding day, and you’ve only got one shot, you want to make sure you pick the right person. While you’re sorting through website or input from your closest recently-married friends, make sure you actually MEET your wedding photographer! Or at least talk to them. Whether it’s on the phone, a video chat, or an in person meeting at their studio, we think it’s important that you connect with your photographer! (Read more about WHY you should meet your wedding photographer here…). 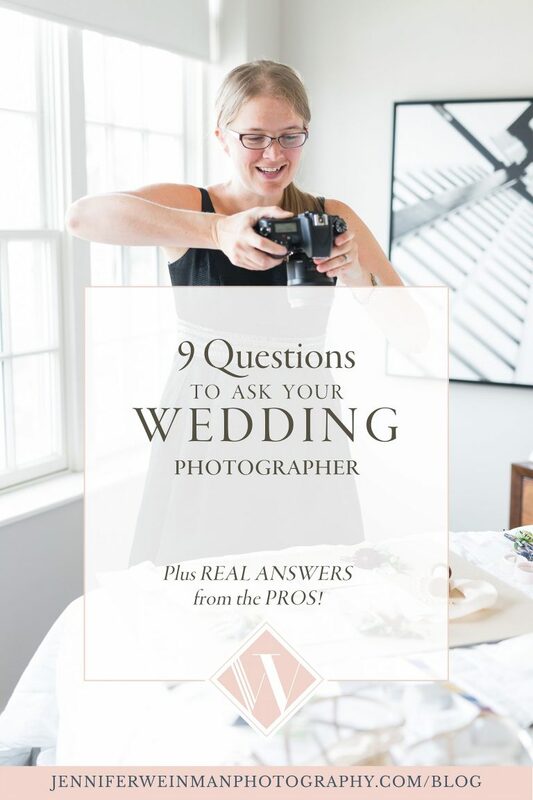 And when you do talk with them, here are the 9 questions you should ask your wedding photographer! Weddings are not something you can do-over, and you don’t want to trust your day with someone who has never done this before. Be sure to ask the photographer how many weddings they’ve photographed. With more experience comes more expertise, especially when it comes to dealing with unpredictable and tricky lighting conditions or challenging timelines. While having a photographer who has shot at your location is a nice bonus, it isn’t essential. Any experienced photographer should be able to handle new locations and situations! For the JWP team, we’ve photographed well over 100 weddings, so we’ve seen it ALL! What happens if you are unable to photograph our wedding? What kind of emergency backup plan does your photographer have on your wedding day? In case of sickness or family emergency, you want to know that your photographer has a network of people they are connected to that can cover for them. For us, we have built in backups because we are team, but we also have a list of backup photographers should they be necessary. What if something breaks or malfunctions during your wedding day? Again, worst case scenario, but you want to know your photographer can continue photographing your wedding without worrying about equipment issues. I would encourage you to ask if they come with 2 cameras, and if they have backups of their lenses. FYI – we ALWAYS bring backup equipment, and have backups of lenses as well! Each wedding photographer has a different turnaround time, and you want to get a sense for yours. Too short of a time, and well….you may second guess the effort put into editing your images. But you also don’t want it to be too long. An average turnaround time for wedding images is somewhere in the range of 4-8 weeks after your wedding. For us, we generally share a sneak peek within a day or so, and then post our favorites on our blog within 2-3 weeks. You’ll see your full gallery within 6 weeks, but usually sooner! Can we view a FULL wedding? If there is one thing you should definitely do when you are choosing a photographer, THIS IS IT. View a FULL gallery from ONE wedding. Websites are carefully curated to show you the best of the best, and to draw you in. They are beautiful images, but can your photographer replicate beautiful images at EVERY wedding or throughout an ENTIRE day? Maybe they are only showing beautiful outdoor images on their website, but can they photograph in a dark reception space? Do they understand how to pose a bride and groom in flattering ways? How many images are there of the couple vs of details? What do family formals look like? If your photographer hesitates to send you a full gallery for you to review, that is a huge warning flag. What is in your contract? Who will be the photographer on our wedding day? 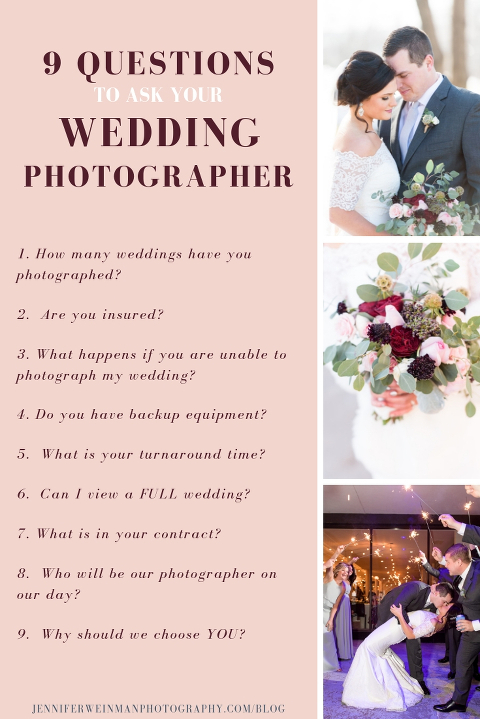 The JWP team has two photographers available for weddings (Jen and Beth) and we want to make sure you are comfortable with YOUR photographer, so it’s a priority that you connect with us on a personal level. With JWP, you choose your photographer when you book your wedding, so there’s no surprise on your wedding day. We also make sure your wedding photographer photographs your engagement session so you guys get the chance to know each other and have that familiarity on your wedding day. If you’re working with a different studio that has a team, make sure you clarify this at the beginning. This is also something to make sure you talk about with your videographer! Why should we choose you as our photographer? I threw this one in there because there are a LOT of photographers out there, but you want to know what sets your photographer apart. Another way of putting this, is what makes them as a wedding photographer unique? Why should they have the privilege of photographing your best day ever? In my opinion, wedding photographers need to be passionate about what they do, and passionate about making your day amazing. If part of their answer doesn’t center around that…you kind of have to wonder why they are doing it to begin with! Other answers that you might hope for have to do with years of experience and expertise, attention to details and customer service, but ultimately….it really should be about YOU! That’s it! There’s lots more you can ask, but we think these 9 questions are the MOST important ones to start. If you find yourself interviewing someone who doesn’t have satisfactory answers to these questions, you know it’s time to move on and find someone else! If you want a handy pretty list to save to your phone so you don’t forget, you can access that HERE! If you’d like to chat with us and find out if we’re the right fit for you, we’d love to hear from you! Be sure to click over to the CONTACT page, and we’ll share our answers with you! Why a Wedding Photography Consultation is a MUST!